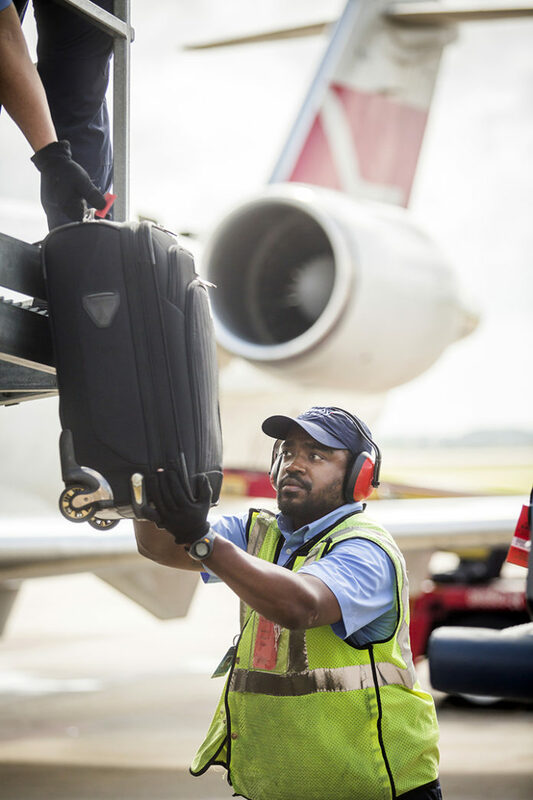 American Ground Services ramp agent Maurice Walker takes luggage from the jetway to load into a American Express jet at the Baton Rouge Metro Airport. Besides loading and tracking luggage, ramp agents are responsible for marshaling aircraft, assisting with pushback and towing and making sure the aircraft has the proper luggage weight distribution. The search committee tasked with finding a new director for the Baton Rouge Metro Airport meets Thursday to try to figure out its next steps, now that the Metro Council has rebuffed the lone candidate still in the running for the position. At its Aug. 22 meeting, a divided Metro Council that was missing several members, failed to approve offering the job to Austin “David” Futch, a Shreveport native who had topped a short list of candidates the search committee and its consulting team had recommended to the Metro Council in July. Search committee chairman Jim Ellis, a local attorney, says he is disappointed that after nearly eight months of hard work—which included retaining an executive search firm for $40,000 to help find and vet potential candidates—a few members of the Metro Council have effectively thrown the entire process into question. In July, the search committee presented a list of candidates to the council that included Futch, an executive with the private aviation firm Cleared Direct, who was unanimously recommended by the search committee; Derek Martin, a former Wayne County airport executive, who received all but one vote by the committee; and Abilene, Texas airport executive Don Green, who received three of the seven committee votes and later dropped out of the running. But the council deferred a vote in late July, prompting accusations from Metro Councilwoman Chauna Banks, also a search committee member, that white council members didn’t want to offer the job to Martin because he is black. Two weeks later, Martin removed his name from consideration, after accepting a job in Erie, Pennsylvania. While that left only Futch, council members deadlocked again, prompting accusations of racial politics from white council members. Banks, who plans to attend Thursday’s search committee meeting, says though she originally voted to recommend Futch for the position she now questions his credentials and wants to open the process to more candidates, including interim airport director Mike Edwards.